February’s Degustabox had a bit of an indulgent theme going on for me, although there were some healthy treats too. I love a good muesli in the morning, so I was really pleased to see a Primrose’s Kitchen muesli. I’ve found Primrose’s Kitchen to be a quality brand in the past and their Raw Beetroot & Ginger Muesli lives up to their reputation. 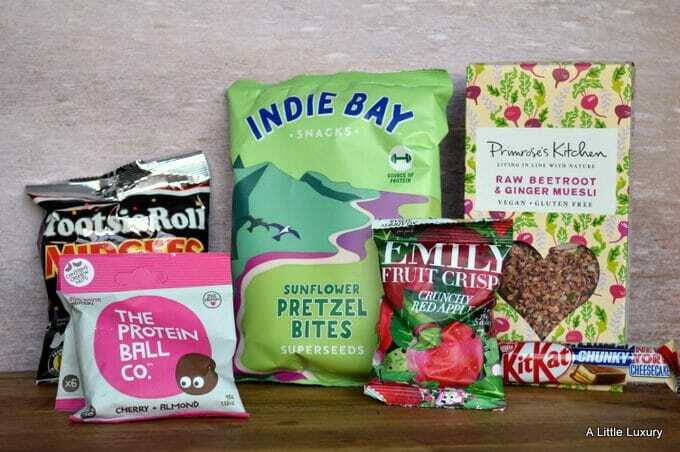 Whilst we are in healthy mode it’s worth talking about Emily Crisps which are fruity (or vegetably – is that a word?) and great for a snack. I liked the Crunchy Red Apple flavour that we were sent. Another way to stave off hunger between meals is The Protein Ball Co.’s Cherry and Almond flavour balls. They are great if you are a fan of cherry bakewells. Slightly more indulgently pretzel fans will like these Indie Bay Snacks Pretzel Bites. They are very moreish. If you like American candy, these Tootsie Roll Midgees will be a great treat – they are a good retro choice too as they have been around since 1896. KitKat’s Chunky New York Cheesecake is a welcome variation on the KitKat theme. I was intrigued to try this True Nepal Cactus Water. It has a crisp, refreshing taste and would be great in your breakfast smoothie. 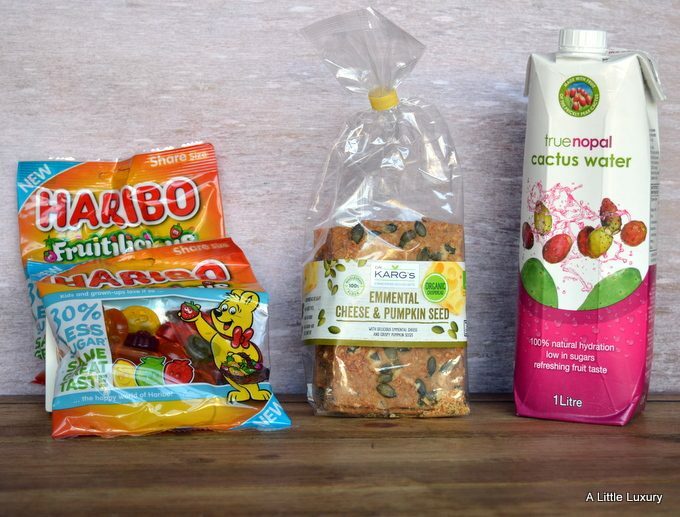 HARIBO Fruitilicious are a new and existing addition to the range. They have loads of fruity flavour, but contain 30% less sugar than regular fruit gum sweets. Great with houmous are these Dr.Karg’s Organic Emmental Cheese & Pumpkin Seed Crispbreads. Really like this concept of getting a monthly box. Smoothies are mine all time favorite, thanks for sharing the awesome suggestions, I am glad to inform you that I have decided to implement it soon.